While a good regular sewing machine can get the job done just fine most of the time, things quickly change when you decide to start taking on more demanding or professional sewing projects. These projects often require a lot of sewing power, and you would really struggle to get the results you want if your sewing machine doesn’t have that kind of power. Also, the regular sewing machine may not be able to handle those kind of projects. And that’s exactly where a heavy duty sewing machine comes in. As the name so clearly suggests, a heavy duty sewing machine is a very powerful sewing machine that can work extremely efficiently and smoothly on professional, large and demanding sewing projects. They have no problem working with extremely thick, heavy fabrics that a usual sewing machine will have a hard time with. So without further ado, let’s jump in and review the 5 best heavy duty sewing machines on the market. First things first, let us make it clear that the Janome HD3000 is not as heavy duty as the Ultrafeed LSZ-1 from Sailrite, but it would turn out to be powerful enough for most users while also being considerably more functional than the Ultrafeed LSZ-1. A particular customer mentioned in their review that they haven’t yet found a fabric it can’t sew through super smoothly and efficiently, although it may not be able to do 8 0r 10 layers of heavy fabrics at a time like the Ultrafeed LSZ-1. However, it makes up for that on the functionality front, by being considerably faster and smoother to operate. This will help you save quite a bit of time as well as make the process more efficient. And despite being faster, it also manages to be quieter, which is why some customers prefer to use it over their more powerful Singer or other heavy duty machine. The feed dogs are powerful too and you wouldn’t have to worry about any threading issues either. There’s also an overlocker foot so you will never regret not having an overlocker sewing machine. One of the more unique features of the HD3000 is that it makes the needle stop as soon as you remove your foot from the pedal, unlike most of the “modern” machines – especially including the ones such an electronic sewing machine – which keep the needle working until it has completed another stitch and then moving upwards. This is something you would like if you used to get frustrated with the extra stitches made by the other machines. There are also many useful extras that you would be pleased to have and the machine is also very easy to use, with the threading being easy as well thanks to the automatic needle threader; although there are no bells and whistles which something like a computerized sewing machine typically comes with. The mechanical stitch selection, too, works well but can be a bit confusing to use. However, you wouldn’t have any problem using it as you use the machine for a longer period of time. The great combination of power and a better level of functionality is what impressed us. 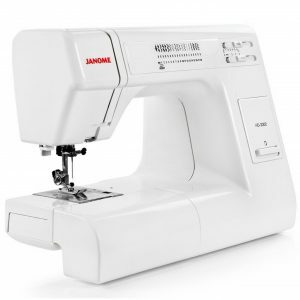 It may not be the most powerful machine out there, but it would certainly turn out to be one of the better ones for users that are after a more all-round sewing experience. Sure, it won’t work like the best mechanical sewing machine on the market, or offer many advanced features, but it would work great at what’s it supposed to do: Letting you do heavy duty sewing in a very functional, efficient way. 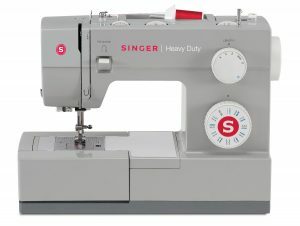 No list of any type of sewing machines can be complete with a Singer, and heavy duty sewing machines are no exception. The 4423, however, is more than just another heavy duty machine. While it does come with a motor that’s 60% stronger than the traditional ones, it also offers other important features such as 23 built-in stitches, an automatic needle threader, as well as an extremely fast speed of up to 1100 stitches per minute. 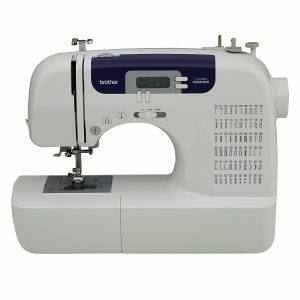 And this is all at a surprising cheap price tag, making it a great heavy duty sewing machine for anyone on a budget. However, that’s without any compromise on the durability whatsoever, as its frame is made using durable metal while the machine itself is very well built too. There’s also a long list of useful accessories that come with the 4423, including a highly versatile foot that works for all types of projects, as well as a zipper foot, button sewing foot, buttonhole foot and more like needles, bobbins, seam ripper and the list just goes on. You can tell from all these accessories that you will be equipped with pretty much everything you need to work on any type of sewing project, perhaps without even needing those dedicated sewing project kits. Also, one of its features that greatly add to the overall functionality and makes it very easy to use is that you don’t have to adjust the tension when you change the fabric weights. The machine is also pretty easy to use overall, and is fairly quiet for a heavy duty sewing machine. While the Singer 4423 might not look like those professional sewing machines out there, but it can work just as well for the right users. It’s very affordably priced, but doesn’t compromise on the durability, functionality, versatility or the power. 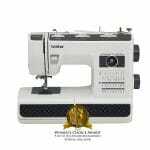 This makes it one of the best semi industrial sewing machines as all the heavy duty sewing machine reviews it has got suggest. The Sailrite Ultrafeed LSZ-1 is the third best heavy duty sewing machine on the market, as it can handle pretty much everything you could ever throw at it. The manufacturer says that it has actually been tested on up to layers of heavy canvas – which means it would work great for even the heaviest upholstery fabric – and up to 8 layers of Dacron. Needless to say, there’s no type of sewing fabric ever made that this beast wouldn’t be able to sew through 8 or 10 layers at a time. Similarly, even some of the more heavier fabrics like denim & chambray would be a breeze to sew on using the Ultrafeed LSZ-1. It’s also a zigzag/straight stitch walking foot machine, and can definitely do pretty much everything the best sewing machine for zigzag stitch can. The “wheel” that it comes with is much more powerful than the flywheel you get with a traditional sewing machine. This not only makes the machine much more durable, but would also make the sewing process considerably smoother for you. Then there’s also a unique clutching system that can completely transfer all the power from the balance wheel to the needle. This is again something that will make your usual sewing easier for you, while adding to the overall versatility you’re offered. You would also have an additional extra wide presser foot with some unique features, which would allow you to work on some of the more complicated projects with a great level of ease of use. However, we would also like you to be aware that getting the tension with the Ultrafeed LSZ-1 can be a bit of a challenge, but should get easier as you get more familiar with the machine. The kind of power it brings to the table would certainly blow you away. 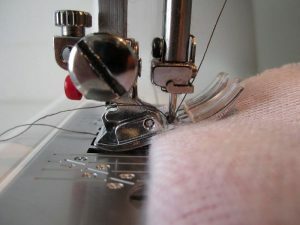 You may have never come across a machine that can sew through 8 or 10 layers of some of the heaviest fabrics out there, with even an extremely heavy knit fabric being no match for its beastly teeth. However, despite being so powerful, it’s also fairly versatile and offers a fair bit of flexibility, while also being very easy to use except for setting the tension which can be a little tricky as we discussed above. So now we have a Brothers heavy duty sewing machine here. And for the price, it really offers a lot of value. It’s a very durable heavy duty sewing machine for sale at this price, coming with a metal needle plate and being made of high-quality materials. This helps with the thread pickup speed, as well as prevents any kind of damage to the threading mechanism. Similarly, it has a sturdy metal bottom, which further improves the durability while adding greatly to the overall stability of the work. This Brother heavy duty sewing machine has also gotten a lot of praise for its ability to handle thicker seams extremely well, while still being fairly lightweight. Further, it’s very easy to use, and different from a typical commercial sewing machine which can make things very confusing for the user until they get used to it. A particular customer mentioned in their review how it performs great for them when sewing on tapestry fabric, as well as any heavy quilting fabric. This also makes it a great sewing machine for quilting. Finally, it’s not a heavy duty computerized sewing machine with a lot of bells and whistles, but it can certainly sew through 3 layers of jeans like a breeze. If you’re looking for the best heavy duty sewing machine for home use on a budget, then the Brother ST371HD may definitely turn out to be your best bet. Well, the Brother ST371HD might not be the best sewing machine heavy duty, but it’s a great budget option for moderately demanding heavy duty sewing. It’s durable enough to last you a very long time, and can easily sew through multiple layers of heavy fabrics like canvas & duct and velvet, among others. Now, here’s an option that’s actually not one of the best heavy duty sewing machines 2018 as far as the sewing power is concerned, but is definitely a more functional, more “complete” sewing machine. As the title of its product page suggests, it’s designed for both sewing and quilting, and actually performs better than the Brother sewing machine heavy duty we reviewed above when it comes to quilting, despite being cheaper. However, as far as the sewing capabilities are concerned, then the ST371HD definitely has an edge over it, due to being one of the best heavy duty sewing machines. But if you’re not looking to work on extremely demanding sewing projects, then the CS6000i would turn out to be just as good. The ease of use it offers is great, making it one of the better options for sewers that haven’t worked on demanding sewing projects before. The stitch selector works great and speeds things up quite a bit. Similarly, there’s an automatic needle threader as well which further improves the overall efficiency and ease of use you’re offered. However, something that we didn’t find in most sewing machines – including the considerably more expensive ones – but did in the CS6000i is that you can adjust the speed, while the maximum speed being 850 stitches per minute. This means a much better level of control for you, making the work much more comfortable and easier. It also comes with a very wide table for letting you work on larger quilting projects, and a built-in free arm for extra flexibility. Finally, the durability is also certainly there, with a particular customer saying they love how well it has hold up after 3 years of regular use. While the Brother CS6000i is not like any other sewing machine heavy duty, it’s more of a balanced combination of a decent amount of power and a lot of functionality. Further, its most highlighting feature is its amazing level of the overall ease of use. You wouldn’t really need a lot of sewing help to get started with your bigger sewing projects, as there are features that make things very easy for you such as a neat automatic needle threader, controllable (adjustable) speed, an extra wide table and more. How We Chose the Top Heavy Duty Sewing Machine in Our List? Choosing the top heavy duty sewing machine is not much different from choosing the best sewing essentials. While the price difference between the two is huge, the process remains pretty much the same; identify your needs, figure out a budget, look for the right features and get the product that will fit into your sewing room and handle your sewing needs well. However, some of you would probably be surprised to see a Sailrite machine as our top recommendation. As it’s not as popular as a Brother sewing machine or a Singer sewing machine, you might be wondering what made us chose it as our best heavy duty sewing machine. Well, the thing is, Sailrite seems to specialize in making sewing machines that are much more powerful than the traditional options you have, meaning they make a much better choice when it comes to a heavy duty sewing machine. Further, the Sailrite Ultrafeed LSZ-1 definitely brings more power to the table than any other sewing machine on the market, and there’s no probably no other sewing machine that can sew through as many as 8 to 10 layers of thick fabrics like it does. As for the other sewing machines, they are very good options for those that may not be looking for a professional sewing machine, but some of them will work great as a semi industry sewing machine while the others are some of the most functional heavy duty sewing machines for sale. Unlike a chainstitch sewing machine or a coverstitch sewing machine – that are a specific type of sewing machine – there aren’t any such different types of sewing machines as far as heavy duty sewing machines are concerned. 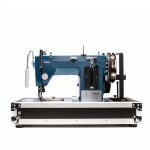 Why You Need the Best Heavy Duty Sewing Machine? Well, when you’re working on large or demanding sewing projects, or are into professional sewing, then you just can’t afford to cut corners. After all, if you don’t get the kind of sewing experience you expect from a generic sewing machine, then it may end up ruining your project, meaning a huge amount of time and effort being lost. Similarly, if a professional sewing project doesn’t turn out to be how it should have, then it could definitely affect your business. And this is why you simply can’t compromise on your sewing machine unless you’re perhaps working just on hobby projects. 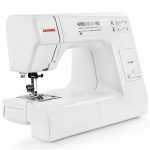 The best heavy duty sewing machine is specifically designed for professional use or demanding sewing projects in mind, so it works great for them. This is not much different than why a dedicated sewing machine for overlock stitching is preferred when working on sewing projects that are almost entirely based around overlocking. 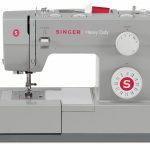 The best heavy duty sewing machines we have reviewed in our post come with a lot of power to easily sew through multiple layers of thick fabrics, some great advanced features that make the otherwise complicated sewing projects much easier, other features aimed at improving the overall functionality and efficiency and more. This helps you work on demanding sewing projects in a much better way, allowing you to get the results you need without having to put in a lot of extra efforts.